So you’ve reviewed your retention strategy and want to try retargeting. It can be daunting at first, but the initial steps are simple. First, you need to define your goals. What are your KPIs? How can retargeting help improve them? This all starts with a conversation about the user funnel. Where do you to need move users? For some apps such as subscription services, you might just need to get them through that first sign-up stage. For others, it’s about pushing users further down the funnel until they finally convert. In some cases, the goal will be to make sure that users in the lower part of the funnel - who tend to be extremely valuable frequent-purchasers - don’t fall out or churn. Once you’ve analysed this, you can begin to segment your app audience based on how you want to target them. In our experience, it’s always best to start simple. This provides us with a benchmark for performance before we move into a set up more intricate and granular. Start by identifying the point of churn. Where are we seeing activity decrease? Next, look at the attribution window to determine how we can unify metrics in order to ensure that in-app activity from retargeting campaigns is only being attributed to retargeting campaigns. Analyse the user flow from ad to app. We want to minimise any friction that would prevent the targeted user from coming into the app and completing the desired actions. Deeplinks are a powerful tool here, as they remove any obstacles from user pathway. Identify the primary goal/key KPI and how the will campaign achieve those goals. Make room to look beyond the primary KPI (such as purchase/subscription) to focus on re-engagement metrics. This enables us to determine what other in-app activity is being incurred in consequence of the retargeting campaigns. Customize your funnel for your unique app. You know how your retargeting campaign will benefit you, now it’s time to consider how it will benefit your users! Creatives Great creatives are a key part of retargeting. We’ve observed a notable difference in performance when clients are serious about strategic creatives. Our in-house design team has consulted with a myriad of apps over the years, so we’ve learned a lot about what works and what doesn’t. In a nutshell: creatives need to be compelling . When we consider the function of a UA creative, we know that the desired action is typically to download. But in the case of retargeting we are asking the user to engage in a much deeper way - perhaps with their time or with their money. This means that each user group might need different creatives, as a call to action might read very differently for a lapsed payer compared to a very active non-payer. Of course, sales and promotions might not be compelling for every app. 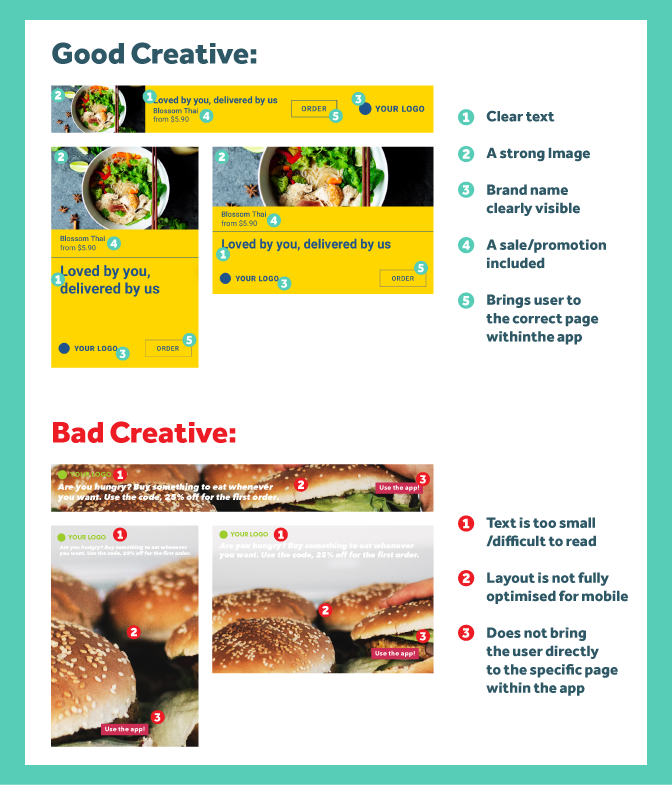 In this case we can find pieces of content, interesting features, or new releases that we can bring to life on a creative to get a user’s attention and bring them back. Once everything is in motion, make sure to give the campaign some time. This is best illustrated with an example from one of our e-commerce clients. This client was aiming to retarget past purchasers, but postulated that all revenue data (revenue incurred from our retargeting campaigns) would be captured within the first 24hrs of the users’ postre-engagement. The client assumed that after 24 hours, the user would cease to show any significant in-app activity, much less a purchase. So we agreed to test the set up and see whether this was true. 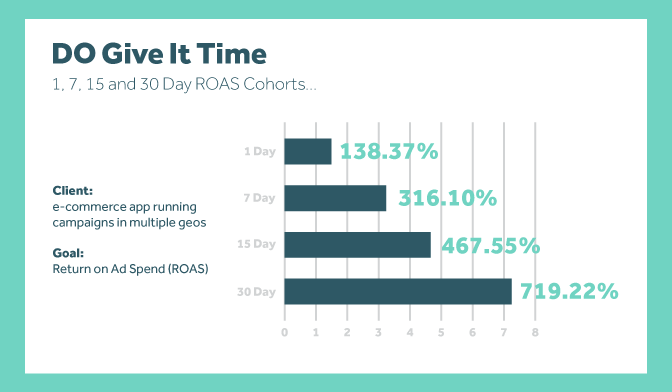 In reality, after using our cohort analysis tool we found that users were continuing to purchase even thirty days after the point of being reengaged. This was particularly insightful and something that we only could have accomplished by analysing a larger window. Conclusion People new to retargeting will often fall into the habit of attempting to draw large conclusions from 48 hours worth of data. But the concept of retargeting is just not conducive to this. While we can definitely see a trend line within 48 hrs, the true impact of the campaigns should be looked at over a much longer period. 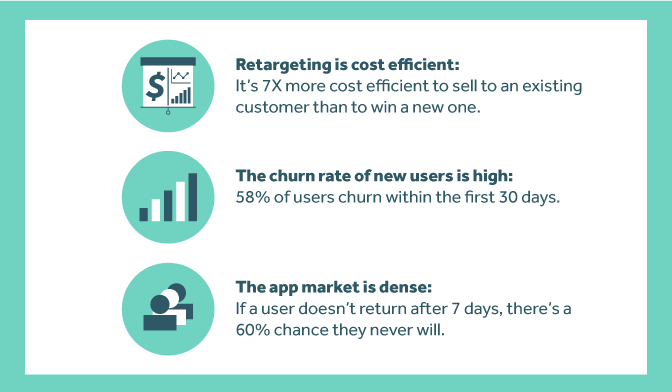 App retargeting and user acquisition are two very different things, so we can’t solely rely on insights from the latter to inform the former. Often, those new to retargeting will assume that the goal is to capture a user’s attention, when in actual fact we should be focusing on inviting intention. So whether that intention is to install, to purchase, or something else, we sometimes focus too intently on getting the users attention on the ad when we are really trying to get them to incur an action. In retargeting, the intention that we want to drive for the user is very different when compared to UA. A strategy that has worked to get a user’s attention and prompt them to download the app won’t necessarily work to re engage them once they have lapsed, so we really need compartmentalise those insights into separate buckets. Customized Creatives Creatives, as we’ve discussed, are also going to be a bit different when compared to creatives for other marketing channels. We know that banners reused for retargeting have twice lower click-through rate when compared to uniquely created retargeting banners. And lastly, one of the most important things about compartmentalizing our UA insights and when thinking about creatives is to ensure you are looking beyond the contextual insights from a user acquisition campaign. The Remerge engine will specifically find users where they convert. Limiting ad placements based on thematic content will only create more obstacles. Let’s discuss an example. Imagine that you have game of military content with army and fighting elements. You might assume that you should only go after users that are spending time in apps that also have a military theme. While this might make sense in terms of matching thematic content, you are missing users who might spend lots of time in other apps - like a high-paying user who likes to check the weather every single day. That’s a prime moment in mobile where we can serve an ad and grab their attention to bring them back. Get started sooner rather than later. Watch our webinar with Adjust to learn more.